← Caption Contest 119: Howdy! I drew this on the plane Sunday. Like, on real paper with a real pen. Crazy talk! I kept looking for the undo button. I’m just gonna go ahead and pretend it’s barry, even if it isn’t. Looks great though, El Jefe. (That means “boss” by the way…. I think.) This just needs to be colored at some point. Also, I think his left hand might be missing a little finger, unless he lost it during an unfortunate accident trying to put the Speed Force into a bottle. (Because apparently in my mind, that seems like something he might try.) Seriously though, nice job. I like it. Are we going to be seeing a bit more SOD with your travels now? I’ll take whatever you give us; pen and paper, or tablet and stylus. It’s good. It really is. *I* certainly couldn’t do as well, and considering you went old-school with the medium makes it all the more impressive. And on a *plane* what with the turbulence, and the pitching and the rolling and the yawing, and kid behind kicking your seat. Considering it’s just a time-killer sketch done under those conditions, top-notch work. So I have absolutely no right to criticize and honestly, you should stop reading this comment right now knowing that I am IMPRESSED. You are both dead to me. I will now stomp off in a huff on my tiny, tiny feet. I wasn’t gonna say anything because my feet are big and wide, and I figured my sense of proportion might be off. . . before anyone asks, I don’t know if what they say about guys with big feet is true, but my wife who can’t have children has borne us two. Damn it, just now realized, days later, that I screwed up my post. Not the right foot, the left foot. 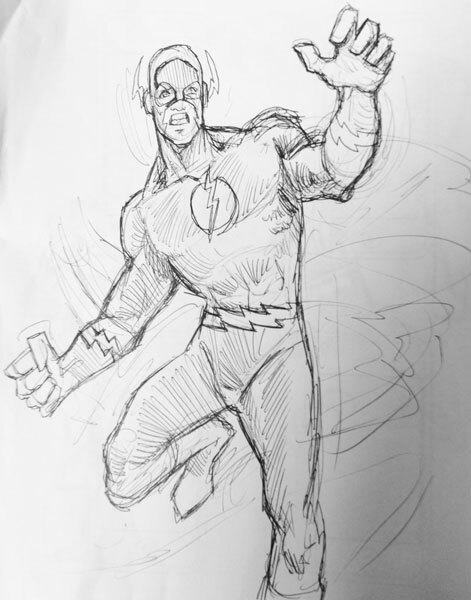 Flash’s left. The one that isn’t there. That’s Liefeldian.